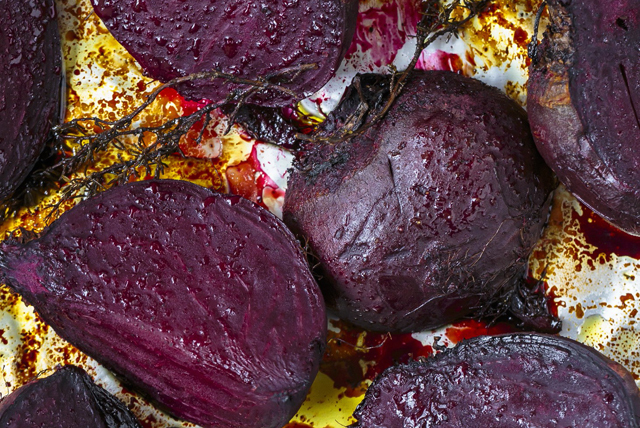 You'll want to try our Balsamic Roasted Beets with Thyme. We take the mystery out of this beautiful fall vegetable by simply roasting, and adding flavourful balsamic dressing to make a spectacular good-for-you side dish. Cover rimmed baking sheet with foil; spray with cooking spray. Place beets, cut sides down, on prepared baking sheet. Top with thyme. Bake 50 min. or until beets are tender, turning after 30 min. Drizzle beets with dressing; stir until evenly coated. Bake 5 min. When handling cooked or canned beets, it's easy to stain your hands and cutting board a bright pink from the juices. To prevent this, wear disposable latex gloves when handling cooked beets and cut them on a large glass or ceramic plate rather than a cutting board.